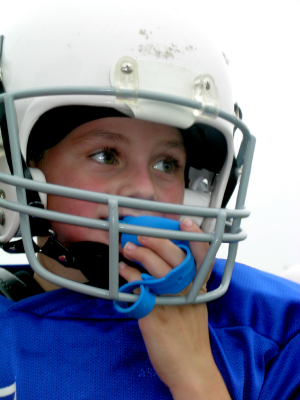 Home » Making Sure Football Helmet Fits: A Simple, But Effective Way To Minimize Concussion Risk? Making sure that football helmets fit properly, and that those with air bladder linings are properly inflated, may be two of the simplest but most effective ways to minimize the risk of concussion and catastrophic brain injury, say researchers in a paper1 presented to the February 11, 2012 meeting of the American Orthopaedic Society for Sports Medicine. The risk of concussion with associated amnesia increased 35% for each increased school grade level, which the authors said may be a function of increased exposure or due to endemic factors. That such percentages have persisted despite improvements in helmet technology led the paper's authors to question whether they were having any protective effect. Consistent with previous meta-analyses, the paper found no definitive data to support the view that advanced football helmet technology and design is more protective against concussion or intracranial hemorrhage. "It is well recognized that air bladders deflate on a regular basis and helmet fitting, particularly in high schools, is haphazard. Yet many thousands of youngsters with poorly fitting helmets and/or deflated bladders receive multiple heat impacts without injury," noted lead author, Joseph Torg, MD, of Temple University. This "strongly suggests" that those who suffer concussion (mTBI) or experience a protracted recovery are predisposed to injury. The protocol, believed by the authors to be the first published protocol for appropriate headgear fitting, was developed with the assistance of Paul Kelly, Athletic Equipment Supervisor at Temple University and a certified member of the Athletic Equipment Manager's Association. The pamphlet that accompanies all newly purchased helmets needs to be kept on file, updated and old versions replaced. Before beginning any helmet fitting session, all the helmets should be properly prepared. Inspect each helmet, inside and out making sure it is clean and there are no defects. Be sure any used helmet has been properly reconditioned. Be certain that the NOCSAE stamp and helmet warning label is clearly legible on the outside of the helmet. Ask if athlete has ever had any prior concussions or a broken nose. Find out what kind of helmet was worn before and if there were any issues. Ask how did it fit and how it felt? Check for any physical abnormalities on athlete's head. This is based on product knowledge and information from the last 2 steps. There will be variance. Athlete may try on 2 or 3 helmets and should select the one most comfortable. To fit helmet selected, follow manufacturers fitting instructions. Inflation should raise the frontal rim of helmet about one inch above eyebrow and snug around circumference of the head. Jaw pads should be touching the jaw and not the ears. The rear padding should be infirm but with comfortable contact with the head. The chinstrap simply keeps the helmet on the head while playing. The chinstrap is not a means to adjust the fit of the helmet. With the cup centered on the chin, the front or high should first be adjusted and buckled followed by the rear or low hook straps. There should be equal tension on all the straps. Crown pressure: Pull helmet straight down on athlete's head. You are looking for the pressure to be evenly distributed on the top of the head and the helmet should not come down on the nose. Lateral grip: Place your hands on each side of the helmet and ask the athlete to hold the head still. Gently force the helmet from side to side. What you are looking for here is the helmet padding to grip the head and not slide across the face. Facial skin should bunch up. Vertical grip: Again, place your hands on each side of the helmet and ask the athlete to hold the head still. Gently roll the helmet backward and forward. The skin on the forehead should move with the helmet and with enough force it will eventually slip a little ,but it should catch on the eyebrow without coming down on the nose. Helmets, especially air bladder helmets, will change throughout the season. Helmets should be examined weekly to insure they remain properly fitted in good condition. Recheck the air-bladder suspension and helmet fit following the above guidelines. Fill the bladder only while the helmet is in place on the athlete's head. Facemasks may be bent with contact. Replace as needed. Check helmet shell for cracks and helmet hardware for rust. Replace screws as needed to insure the facemask can be removed easily in an emergency. When you have completed the fitting, ask whether the athlete is comfortable with the helmet, and let the athlete know that you are pleased with the fit. Record all pertinent information about the athlete's helmet and be sure it is specifically distinguished for the respective athlete. Be sure to explain to the athlete what you are doing through each step and why. This serves 2 purposes. The athlete's trust in you is reinforced and will be confident not worrying about getting hurt when playing. More importantly it educates the athlete to quicker troubleshoot any problems that may occur with the helmet. 1. Torg J, Boden B, Hirsch H, Fowler J, Gaughan J, Comstock RD, Tierney R, Kelly P. Athletic Induced mTBI and Catastrophic Intracranial Injuries: Determining Helmet Efficacy and Predisposing Injury Profiles. Presentation Paper AOSSM 2012.